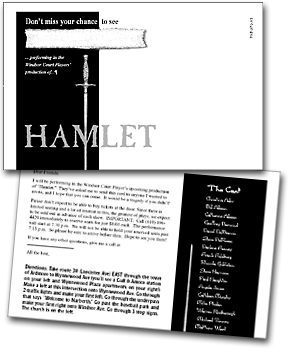 The Windsor Court Players' needed promotional materials for their production of William Shakespeare's Hamlet, including a poster, playbill, direct mailer, and t-shirt for the production crew. By using strong colors and a slightly distressed font, I played off of the tension and brooding quality of the main actors' photo. The sword image, scanned directly from a real sword, is the unifying visual element for all of the pieces. I used it vertically in every instance, to give the sense of a world torn asunder. The direct mailer had an unusual customizable function. 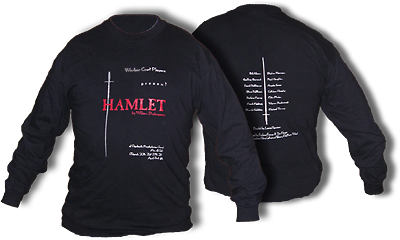 The front included a "scrap paper" area where the name of a cast member could be written in, by hand. 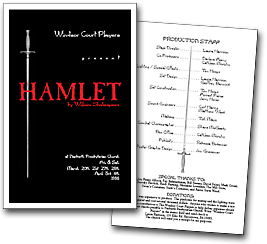 When a name was in, the piece would read, "Don't miss your chance to see (name) performing in the Windsor Court Players' production of Hamlet."